Hello readers! 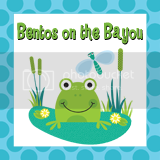 This is Rebecca of Bentos on the Bayou, and I am incredibly excited and honored to be your guest blogger this week! 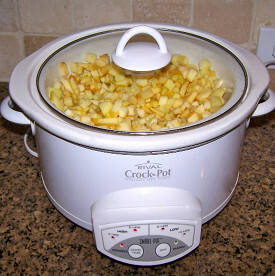 Today I am sharing a very simple recipe that is one of my children’s favorites: Homemade Crockpot Applesauce! Both of my children love applesauce, and it makes a great snack. 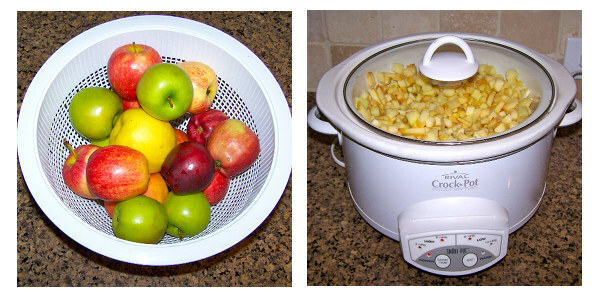 Using your crockpot/slow-cooker, this applesauce is a breeze to make and absolutely delicious. In fact, we always eat a little of the sauce while it is still warm. It tastes just like apple pie (so much tastier than the store bought variety), and my kids call it God’s candy! I used to buy the organic applesauce available at my local grocery store, but it was close to $5 per 24 oz. jar. Since that jar doesn’t go very far, I needed to find a more economic solution. The idea for a slow-cooker applesauce recipe came to me as I washed the organic, whole apples I had purchased for our family. Each week, I purchase several bags of organic apples. It is much cheaper to purchase the apples in 3-5 pound bags, but there are always a few with bruises. If one has a bruise, I generally just cut it off and serve the apple cut up. Looking at the bruised apples, I decided to use them for my sauce. For the first batch, there weren’t enough bruised apples to make a whole pot of sauce, so I added some of the non-bruised ones (now, I just buy one extra bag each week). And,guess what? Making the sauce couldn’t be simpler — in fact, I can’t imagine ever purchasing store bought applesauce again! Terra Cotta in color, this simple, no-added sugar sauce is heavenly. Next, dice them up and add them to a 6 quart slow cooker. Put the lid on and cook them on high for 4-6 hours. To store: place sauce into mason jars and put it in the refrigerator for use throughout the week. 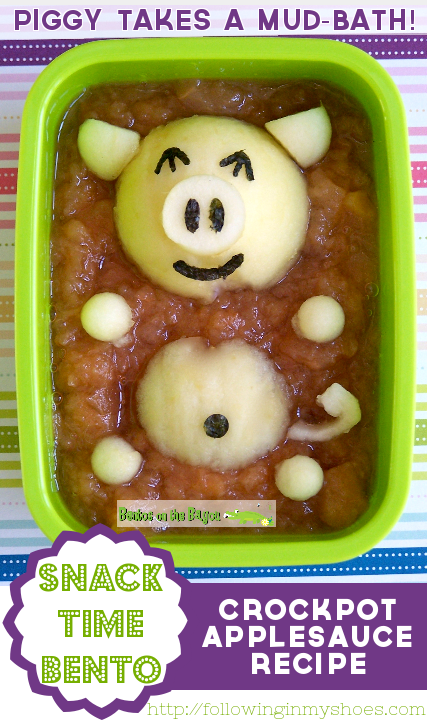 To Freeze: the applesauce can be portioned out into ice cube trays or silicone molds and flash-frozen. Once frozen, remove from the molds and store in freezer-safe bag or container. Individual servings can be removed and placed in bentos/lunch containers; they will be thawed but still cool by the time your child eats lunch! While I generally just serve the applesauce in a bowl, last week, I surprised my children with a quick bento-style snack. I began by spooning the sauce into a small, snack-size bento box. Then I cut an apple in half and got out a muffin scoop and a melon baller. I scooped two ½ balls with the muffin scoop, one scoop with the larger side of the melon ball and two scoops with the smaller side of the melon baller. You can see from the picture that they aren’t perfect, but they don’t need to be. I placed one large ½ scoop into the sauce for the head and sliced a bit off the top of the other for the belly. Next, I cut the large melon scoop in half. I cut one of those halves in half again for the ears and sliced the top off the other for the nose. I cut each of the two smaller melon balls in half for the piggy’s feet. I hand cut the tail and placed each component in the box. I did one punch of nori with a hole punch for the belly button and used a face punch for the face. I placed the pieces on the piggy and took my photo. All that took about 5 minutes! That’s certainly a few minutes longer than it takes to just scoop the sauce into a bowl, but it made for a fun little snack for my sweet kids. It isn’t something I would do every day, but they loved it!